You are currently browsing the category archive for the ‘Aid/Relief Work/Development’ category. –Chinese woman goes way off-message on the Olympics – Opps…someone had diarrhea of the mouth and now they are unemployed. –For China, stability comes before democracy – This is an excellent editorial on the rise of Chinese democracy by Francis Fukuyama. –Thousands march for democracy in HK – They do this every year, and as I said, the CCP believes it is in their interest to delay any form of real democracy in Hong Kong as long as they can. China says they are about 10 years away, but I would say 15 years. Do not expect any movement on this issue before the Mainland becomes a upper middle income country. By that time I believe the CCP will be less concerned with a democratic Hong Kong being able to politically destabilize the mainland. From what I understand, these type of demonstrations attract fewer and fewer people every year. I think many people still care; they just realize that the CCP is not going to be swayed. 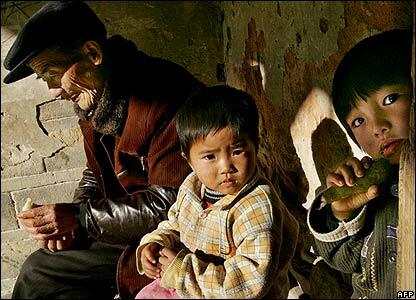 There has been a lot of talk about the true state of poverty in China after the GDP (PPP) reevaluation. Henan is a great example of the challenges facing China. It is one of the most populated provinces in China (in overall people and density) and has a very poor and restless population. I think the CCP is in a race to develop China before a serious uprising occurs due to inequality and the relatively uncontrollable spread of information. The more open China is, the more potential for economic uplift, but also the less control over information. As rural people know how people outside of their areas in China live and how foreigners live (like in the West or even Hong Kong and Taiwan) there will be more unrest. The CCP knows Chinese history well; they know many uprisings have come from rural areas, especially in bad economic times and from nongovernment controlled religious groups. All boats are rising, but not at the same rate, and the rate of change between them is increasing, not decreasing. This is why Hu Jintao spent so much time speaking about creating a “harmonious society” during the 17th Party Congress last year. I think Western people often get the idea that China is a prosperous country, even a developed one, but in reality it is really a developing country with rural poverty on the same level of many sub-Saharan African nations, less than 2 or even 1 USD a day; there are 450 million of these people (35% of the total pop). This is equal to trying to lift 1/2 of Africa’s population out of poverty. I would qualify that by saying there are not many starving people in China, when I speak of African like poverty I’m not speaking of famine. I am also highly skeptical of data coming out of China, especially from rural areas, as party officials are known to inflate their numbers and act like little emperors in their region. Stealing and misallocating public funds, creating local taxes by fiat are not uncommon. I have blogged about this before. So can China win the race. I’m very optimistic, but not “sold”. –Komura: Japan not seeking ‘rewards’ – I blogged about the Japan-Africa relationship before. This article reveals that Japan’s government is renewing its commitment to sustainable development aid measures in Africa and heavily implies they are “not after Africa’s resources like China”. This is not all altruistic, aid allocation never is. 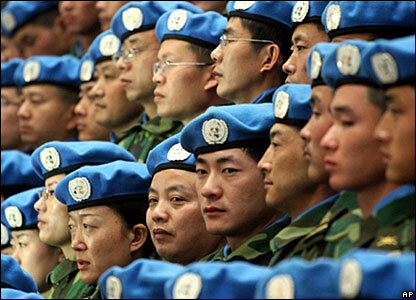 Japan is seeking a permanent seat on the security council and Africa has 53 nations. Upping aid from its current 10% on the continent might sway more to back Japan. –S. Korea’s Lee moves to revitalize relations – South Korea’s president elect, Lee Myung Bak, is seeking better relations with Japan. This is somewhat surprising to me since he has a history of being anti-Japanese, but I suppose he is a pragmatist. It is easy to be a anti-Japanese mayor, but not so easy to be an anti-Japanese president in the region. It is positive he is already seeking regional support to deal with the North Korean issue. –Liberia: Charles Taylor Trial Gets Under Way – Considering what this scum is responsible for in Liberia and the neighboring Sierra Leone, the child soldiers; drugs; rapes; mutilations; corruption; mental trauma of the victims. Taylor is a sub-human monster that should be hung like the war criminals of World War II. Some people are not fit to live, and there is nothing wrong with culling the herd. Here is a site that is monitoring the trial, Charles Taylor Trial. –Liberia: Market Women Help Revive Economy – There is some good news in Liberia. Not only do they have a woman president, Ellen Johnson-Sirleaf, who seems to be respectable; but women are reviving the market! Johson-Sirleaf owed a debt to these women who were instrumental in her election, so she set up a Sirleaf Market Women’s Fund; more about this in the article. While reading the article, I saw similar dynamics in Liberia as in Sudan during the time of conflict. Women would be the ones foraging for goods, because they were least likely to be killed or forced into a militia. In Darfur, the choice was between a man possibly being killed and a woman raped, so often they sent the woman. In any case, I am quite happy with the industriousness and entrepreneurship I see in Liberia. –Kenya’s Odinga Calls for Mediator to Resolve Crisis – Sitting president Kibaki called for a power sharing plan, which was rejected by Odinga. Odinga wants international mediation lead by John Kufour, Ghana’s president. He is insistent that the true winner of the election is not known and needs to be discovered. This makes sense to me to uphold the rule of law. In this situation, if there was significant ballot box stuffing; a recount will not help. They will need to do a new election that is heavily supervised by foreign monitors. I believe Kibaki will oppose this as long as he possibly can, for obvious reasons. –China planning Taiwan Strait route for commercial aviation – China appears to be muscling in on airspace very close to what has been traditionally controlled by Taiwan. This has the effect of limiting Taiwan’s military exercises in the straight. I see this as a duel maneuver for China. They can reinforce the idea to Taiwan that their is “one China” and the shots are called from Beijing. At the same time; China can relieve air congestion between Shanghai, Guangzhou, and Beijing without opening up strategic airspace over the Mainland. Taiwan is crying foul to Washington, and the Bush Admin is doing some behind the scenes mediation. If I were Taiwan I would use whatever leverage I have to resist this. I believe China is trying to intimidate; as well as, test the resolve of the U.S. over the Taiwan issue. –Nigeria: Ribadu Remains EFCC Chairman – Presidency – I blogged on this before. The controversy was that Ribadu appeared too successful at his job and was being “sent away” for an extended period. Here is an update of the brouhaha this has caused. The fact it has caused major outrage is a good thing though. –UK Doubles Contribution to African Development Fund – This is great! $863 million will go far on the continent. The monies will be tracked through projects of the Millenium Development Goals, which include “improving the productive capacity in Africa, promoting economic integration, investing in infrastructure, private sector development, developing the skills needed to be competitive, as well as stepping up engagement in fragile states”. –Uganda: Fuel Prices Double As Stocks Run Out – This is a great example of a relatively stable and prosperous landlocked nation hindered by its much larger unstable conduit to the sea. A common problem in Africa as so many nations are landlocked.